USA Bolero Croc Skin, LP-Shaped Guitar from DBZ Guitars. DBZ Guitars has announced the Croc Skin Bolero. DBZ assures that "there’s no pattern in nature more rock n’ roll than crocodile skin," and the Croc Skin Bolero is presented as "the first guitar in the world to wear it proudly without harming any animals." The finish is actually a textured maple top, produced using proprietary DBZ technologies. It has a thick cut maple top and custom-voiced DBZ pickups. A custom designed and engraved DBZ tailpiece made of lightweight alloys supposedly adds to the guitar’s sustain, while the slick mahogany neck is designed to give players a fast stable platform. Made in the USA, the Croc Skin Bolero features a solid mahogany body and a 3/4" maple top with proprietary Croc Skin finish. It also includes a 22-fret set mahogany neck and an ebony fingerboard, custom DBZ private label humbucking pickups, a custom-designed lightweight DBZ stop tailpiece, graphite saddles and Sperzel tuners. No pricing or availability information. 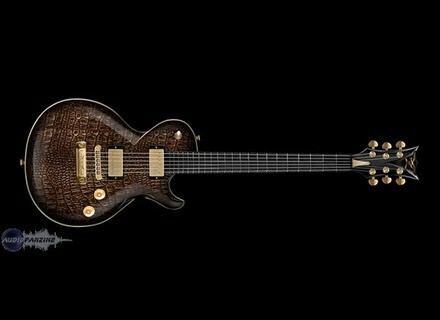 For more information, visit www.dbzguitars.com. Roland Ships Cube-80X Roland has announced the availability of its new CUBE-80X Guitar Amplifier. Gibson Limited Edition Eye Gibson released a new model in its Limited Run Series, the Limited Edition Eye on April 1st. ESP LTD Graphic Series Clockwork Zombie II UK-based artist Mister Sam has once again created hybrids of man and machine with his custom artwork on the new limited edition Clockwork Zombie Graphic Series guitars for ESP's LTD.